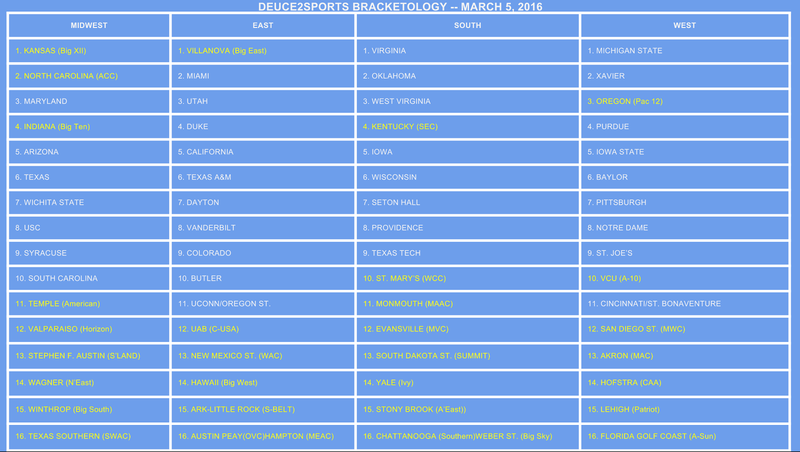 The Deuce2Sports bracket is back! While we haven't posted an official bracket this season, we've been monitoring teams all year round and are confident this is the year 68-for-68 happens. 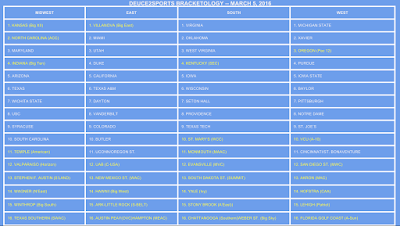 We're still one day away from the end of the regular season, but bracket madness is in full swing. Like most years, there's plenty of potential movement at the top of the bracket and a revolving door at the bottom. A reminder to all those "First Four" teams: You are not safe (see Wichita State's Missouri Valley Conference semifinal loss as the latest example of a stolen bid). It's pretty clear, regardless of conference tournament results, that Kansas and Villanova will garner No. 1 seeds. Virginia should be a No. 1 seed barring a crazy bad loss (ACC Tournament quarterfinals to Virginia Tech?). That leaves, by my count, six teams battling for the last No. 1 spot. I have Michigan State on the top line now for a few reasons. First, the Spartans are playing their best ball now and the rough stretch during the season came when potential National Player of the Year Denzel Valentine was injured and when he just came back into the lineup. Also, three of MSU's losses are by a single point. The biggest competitor is probably North Carolina, although I would argue the Tar Heels have No. 1 seed talent but a No. 2 seed resume. Oklahoma, Miami and Xavier are also teams that, if other teams fall and they win their respective conference tournaments, could grab the West's No. 1 seed. That sixth team? Try Maryland. The Terrapins would have to win the Big Ten Tournament, which would include wins against Purdue, Michigan State and Indiana/Wisconsin in the title game. Those three neutral-site wins might be enough momentum, assuming Maryland can win at Big Ten champ Indiana on Sunday, to take Maryland to the top line. It's definitely a long shot, but every committee values tournament championships differently. My personal ranking of the battle for that final No. 1 seed: Michigan State, Oklahoma, North Carolina, Xavier, Miami, Maryland. It's going to be a wild championship week.